In an exhibition curated by Ali Subotnick which “explores the comedic impulse in contemporary art,” THE PARTY was inspired by the Blake Edwards film of the same name. THE PARTY, through August 31. ANTON KERN GALLERY, 16 East 55th Street, New York City. 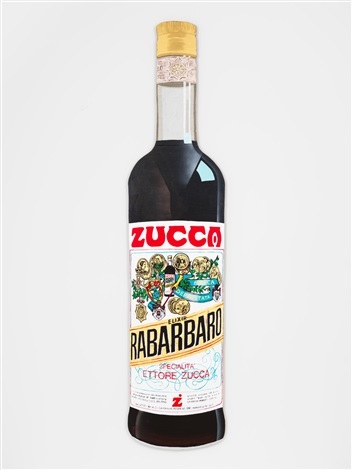 Above: Pentti Monkkonen, Rabarbaro Zucca, 2018. 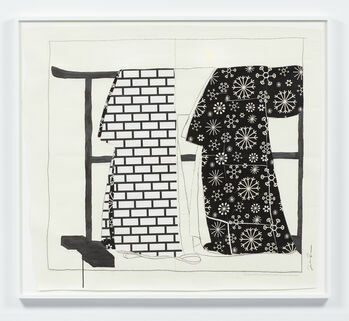 Below: Frances Stark, Bricks and Flakes, rough sketch for a kimono series, 2014. Images courtesy of the artists and Anton Kern Gallery. This entry was posted in ART and tagged Ali Subotnick, Anton Kern Gallery, Blake Edwards, Catharine Czudej, Dan Ciesielski, David Robbins, Frances Stark, Jason Meadows, Jeffrey Vallance, Jennifer Rochlin, Marepe, Pentti Monkkonen, Peter Land, Ruby Neri, Sean Landers on July 30th, 2018 by Barlo Perry. The new artist’s book …MY LIFE IN THE SUNSHINE—LIZ CRAFT 2006–2017 is a stream-of-consciousness visual diary of Craft’s life and practice, featuring family and friends in California, Berlin, Washington State, Oslo, New York and beyond. The 185 pages of color photographs include contributions by Craft’s partner Pentti Monkkonen, as well as Lena Henke, Paul-Aymar Mourgued’Algue, Dorothée Perret, and Fabian Marti and many others. …MY LIFE IN THE SUNSHINE—LIZ CRAFT 2006–2017 (Los Angeles: DoPe Press, 2017). Above: Liz Craft, Mermaid (Becky), 2008–2015, Whitney Museum of American Art. Below: Liz Craft, Mushroom Bubble (Black), 2016. Images courtesy of the artist. This entry was posted in ART, BOOKS/PERIODICALS, PHOTOGRAPHY and tagged dope press, Dorothée Perret, Fabian Marti, Lena Henke, Liz Craft, Louisa Elderton, My Life in the Sunshine (Craft), Paul-Aymar Mourgue d'Algue, Pentti Monkkonen, Whitney Museum of American Art on July 1st, 2018 by Barlo Perry. Matt Johnson, Drywall #5 (Baby Aqua M440–3), 2017. This group show at Venus’ Boyle Heights outpost features work by Kelly Akashi, William Anastasi, Vern Blosum, Will Boone, Jedediah Caesar, Center for Land Use Interpretation, the Crenshaw Cowboy, Catharine Czudej, Jaime Davidovich, Harry Dodge, Sam Falls, Francesca Gabbiani, Kim Gordon, Matt Johnson, Lazaros, Jason Matthew Lee, Jason Bailer Losh, Tony Matelli, Pentti Monkkonen, Ruben Ochoa, Jon Pylypchuk, Ry Rocklen, Nancy Rubins, Sterling Ruby, Analia Saban, Blair Saxon-Hill, Max Hooper Schneider, Daniel R. Small, Piotr Uklanski, Kaari Upson, and Chris Wiley. CONCRETE ISLAND, through May 20. VENUS LOS ANGELES, 601 South Anderson Street, Los Angeles. This entry was posted in ART, PHOTOGRAPHY, VIDEO and tagged Analia Saban, Blair Saxon-Hill, Catharine Czudej, Center for Land Use Interpretation, Chris Wiley, Concrete Island (Venus), Daniel R. Small, Francesca Gabbiani, Harry Dodge, Jaime Davidovich, Jason Bailer Losh, Jason Matthew Lee, Jedediah Caesar, Jon Pylypchuk, Kaari Upson, Kelly Akashi, Kim Gordon, Lazaros, Matt Johnson, MAX HOOPER SCHNEIDER, Nancy Rubins, Pentti Monkkonen, Piotr Uklanski, Ruben Ochoa, Ry Rocklen, Sam Falls, Sterling Ruby, the Crenshaw Cowboy, Tony Matelli, Venus Los Angeles, Venus Over Manhattan, Vern Blosum, Will Boone, William Anastasi on April 22nd, 2017 by Barlo Perry. This week on the blog we visited the new exhibition Paris De Noche at Night Gallery; we had a review on the last days at Art Basel Miami; we passed by Faire des Fleurs, a show curated by Camille Azaïs at Florence Loewy; we heard about a new limited edition: Initiation; and we finally saw Pacific Sun, a stop-motion film by photographer Thomas Demand. This entry was posted in FILM and tagged Aller Retour Paris, Amy yao, Andrei Koschmieder, Ann Craven, aurélien mole, Batia Suter, Camille Azaïs, Christophe Lemaitre, Daniel Gordon, faire des fleurs, Florence Loewy, Inga Kerber, Jean-Luc Moulène, Kate Owens, Los Angeles, Morgan Courtois, NIGHT GALLERY, Pentti Monkkonen, Rémy Brière on December 14th, 2014 by Alice Dusapin.